When you put the keypad entry system Arduino project into the enclosure, you might want to transfer the circuit to a half-size breadboard that takes up less space and accommodates the Max72xx driver, transistor, and relay circuit. The LED display and the keypad are mounted to the front faceplate of your enclosure, so you won’t need extra room for them on the breadboard. Alternatively, you can transfer the circuit to a piece of stripboard and solder the components together for a more rugged finished project. Whether you will keep the project on a breadboard or transfer it to a stripboard or perfboard, ribbon cable makes it easy to attach all the connections to the IC, and your enclosure won’t end up as a rat’s nest of wires. 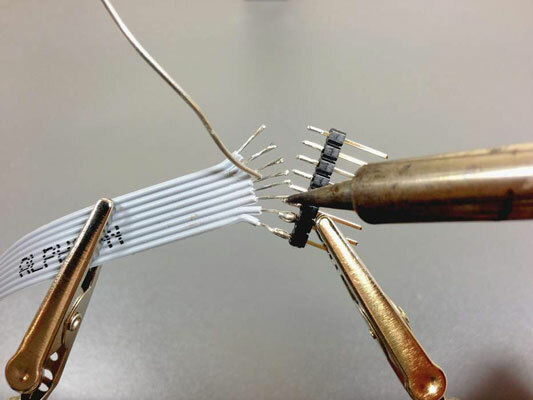 If you are using a breadboard, attach pin headers to the ribbon cable to ensure a stable connection. If you are using stripboard, you can solder your ribbon cable directly to the board. A dab of hot glue applied at the point the ribbon cable meets the stripboard will relieve some of the strain on the soldered connections so that you don’t damage them during installation. 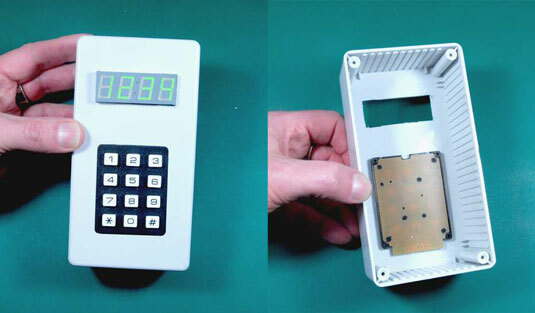 You can also use the glue to hold your display, Arduino keypad, and circuit board. For a really professional finish, use an enclosure that has internal bosses onto which you can bolt your Arduino, stripboard, and keypad. However, choosing the right one for your components can be tricky, and these enclosures can be expensive. A bit of hot glue goes a long way. On a stripboard, the copper strips on the underside will short together the pins of your LED Driver IC. You should use an X-ACTO knife or a stripboard trace cutting tool (Rapid #34-0600) to cut the traces. A 3mm drill bit will also do the job. 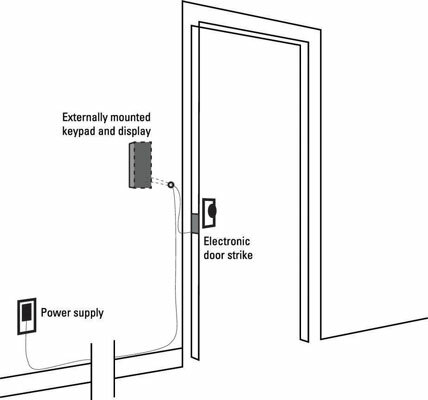 You run power leads from the wall to your enclosure and from your enclosure to the door strike or other lock actuating mechanism. You need to drill a small hole through the interior wall to the exterior wall. How you do this will depend greatly upon the circumstances of the door you are securing. Is it an interior door or an exterior door? Do you need to drill through brick or masonry? Your particular circumstances will determine how you mount the enclosure and run the wire. 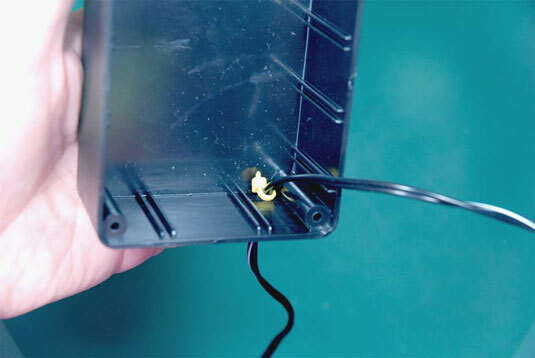 The power leads pass through holes in your enclosure, and you need to secure them to make sure they won’t pull out or put stress onto your internal components. You can either use cable strain relief glands, or you can create a sort of strain relief by affixing a wire tie (zip tie) to the cables on the inside of the enclosure. That way they won’t be easily pulled out. A dab of hot glue on the interior will keep the cable from moving around. The only remaining task is to install the door locking mechanism itself. You will likely need to use some light woodworking tools to shave off additional wood from your doorjamb to accommodate the electronic strike. 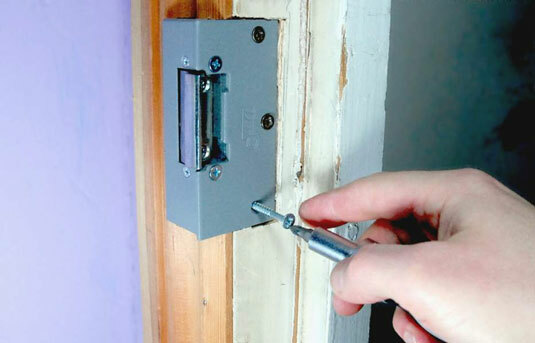 Remove the existing strike plate to reveal the bare jamb underneath. Mark the profile of the strike plate onto the wood and use a small chisel and hammer to carefully tap out the excess wood to accommodate your strike plate. You need to ensure that you have enough room in the door frame to secure it. The final task is to screw the strike plate into the jamb and test the fit. Make sure the door latch travels freely into the strike plate. On most models, you can adjust the depth of the strike plate assembly to match your door latch. Now, shut the door for the final test, and for good measure, lock yourself on the outside!